Three new 2018 Cat® articulated trucks—730, 730 EJ (Ejector), and 735—replace their C Series predecessors and offer new operator stations, transmission-protection features, a new hoist-assist system, an advanced traction control system, new stability-assist system, and a fuel-saving ECO operating mode. The 730 and 730 EJ have 28 tonnes payload capacity and the 735 has 32 tonnes. The new 730 and 730 EJ are also enhanced with automatic retarder control and a hill-start feature. The 735 retains these features from the C Series model and further incorporates a new Cat C13 ACERT™ engine, Cat CX31 transmission and structural and dimensional modifications that reduce empty weight by 22 percent. These features combine for a fuel efficiency gain of as much as 18 percent while retaining the productivity of the previous model. A new combined transmission-and-hoist lever provides efficient, single-lever control of vehicle speed and body-hoisting functions to reduce operator effort and to automate repetitive operations. The standard Cat Detect/Stability-Assist system monitors the working angle of the tractor and body, as well as the grade, and cautions the operator if the machine is approaching the set threshold angle, stopping the dump process if continued action may result in potential tipping. The 730 EJ is designed to eject loads while traveling, providing positive dumping of the entire load, even when the material is sticky. Further enhancing safe operation is the Advanced Automatic Traction Control system, which features refined technology for proactively applying differential locks to avoid wheel spin. Also, a throttle-smoothing system prevents acceleration surges when traveling over extremely rough terrain. 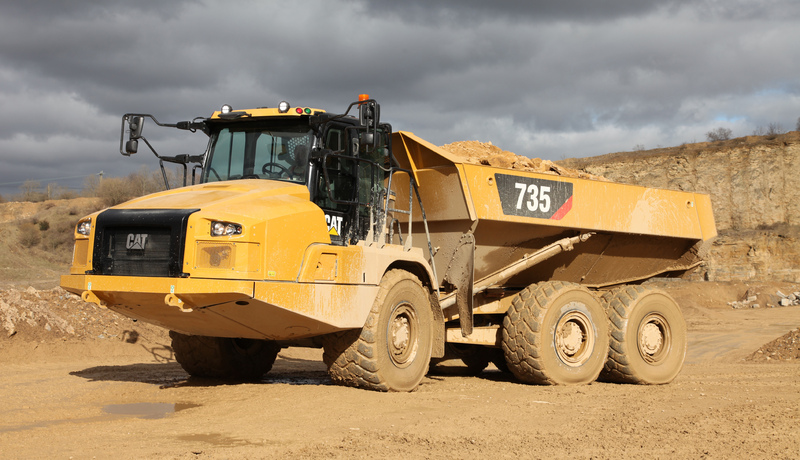 The optional Cat Connect PAYLOAD technology calculates payload via sensors on the suspension, and load-status lights at all four corners of the cab roof ensure visibility to the loader operator from any angle. The C13 engine used in all the new trucks is available in configurations to meet emissions standards in all regions of the world.